This past Saturday Steven and I went to work and got started on Charlie Beth's nursery. We (and by we, I mean my husband) cleared out everything from the former "man cave," and I then I gave the room a quick dusting before we started on the paint. The room is fairly small, so we figured we would be able to knock the paint job out in a couple of hours max. We were wrong. You see, the room has paneled walls. Not just any paneling either. No, these walls have some pretty unique detailing and many, many grooves. Have you ever painted paneling? It's a huge pain! Five or so hours of painting later, we were fresh out of paint and still had half a wall and major touch ups to complete. Finally by Sunday afternoon, however, Charlie's Beth's nursery had a fresh coat of paint on the walls and I couldn't be happier about the color! Next up we (and by we, I once again mean my husband) will put her crib together. I can't wait to watch this room transform into our daughter's special nursery. Speaking of, since finding out we were expecting a baby girl I've been working up nursery ideas in my head. I knew that I wanted pink and I wanted girly. Above are some of the pictures I've been pinning to my baby board on Pinterest to use for inspiration. I just love the soft hues of the pinks and greys. I already have her bedding and curtains picked out and waiting to be ordered. I'm still on the hunt for a good rug, so if you have any ideas where I can find an affordable rug to go with the nursery theme, please send them my way! Her room is still pretty bare right now, but I can already tell that it is going to be my favorite room in the house. Eee!! Nursery stuff is so much fun! I wish I had had all my thoughts as together as you do!! Can't wait to see what you do!! Aaaaand can't wait for tacos tonight!!! I love all your inspiration pictures!! Such pretty, calming colors. Absolutely LOVE the look you're going for! As soon as I got the slightest glimpse of the pictures, I was silently screaming "YES! YES! YES!!". Absolutely LOVE the inspiration! Some of my favorites for sure :) Can't wait to see it once it's all done! I know exactly where you can find a good quality rug, and even that rug in the photo! I have the same rug in navy and white and used it in my living room for a while. You can find it on RugsUSA.com. The prices look a little steep but they always are 70-85% off with free shipping So mine didn't cost much at all! I love the grey and pink. It makes it girly but not too girly. I have never been a fan of pink walls and I think they grey really tones down the pink and makes it soft and pretty. Oh and I have painted paneling before! My basement was all hideous wood paneling when we moved into the house. It ate all of our paint but the finished product looked way better than it did before! I can't wait to see the finished product!!! I know it is going to be absolutely adorable. I love all of your inspiration pictures up there, they are perfection! 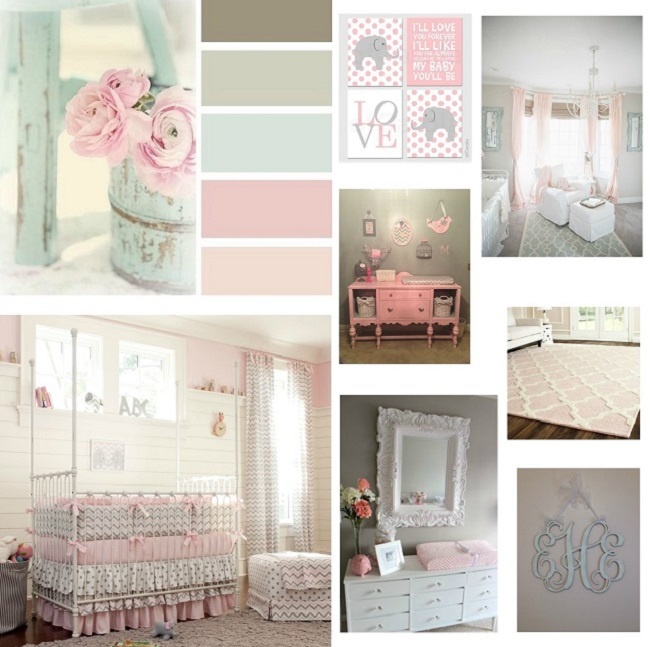 Totally my taste, subtle hues and girlie :) I know that the nursery is going to turn out amazing!!! Have you looked at At Home, Bargain Hunt or Dirt Cheap for the rug? They usually have really good prices but are hit or miss. Home Goods sometimes has some great ones too! At Home has great frames for the walls too. You know...while you are there. And I am pretty sure they had elephant decor too ;) ;) Cant wait to see you tonight! Everything in your inspiration is so precious! Very much along the lines of what I was planning if Baby Mac was going to be a girl (and girl stuff is so much more fun hehe). Sounds like you got a lot of work done, however tedious painting may be. I can't wait to see it all pulled together. I'll be checking back her for rug choices as well....having a hard time finding something in our price range. I found the perfect one at our Pottery Barn outlet but it was still more than what we were willing to pay. I love it! My sister did her nursery in baby pink and grey elephant theme and it turned out very pretty. Home Goods is a great place to find a ton of stuff! It's going to be beautiful!! I love the paneled walls in the picture on Instagram! They are going to add so much character. 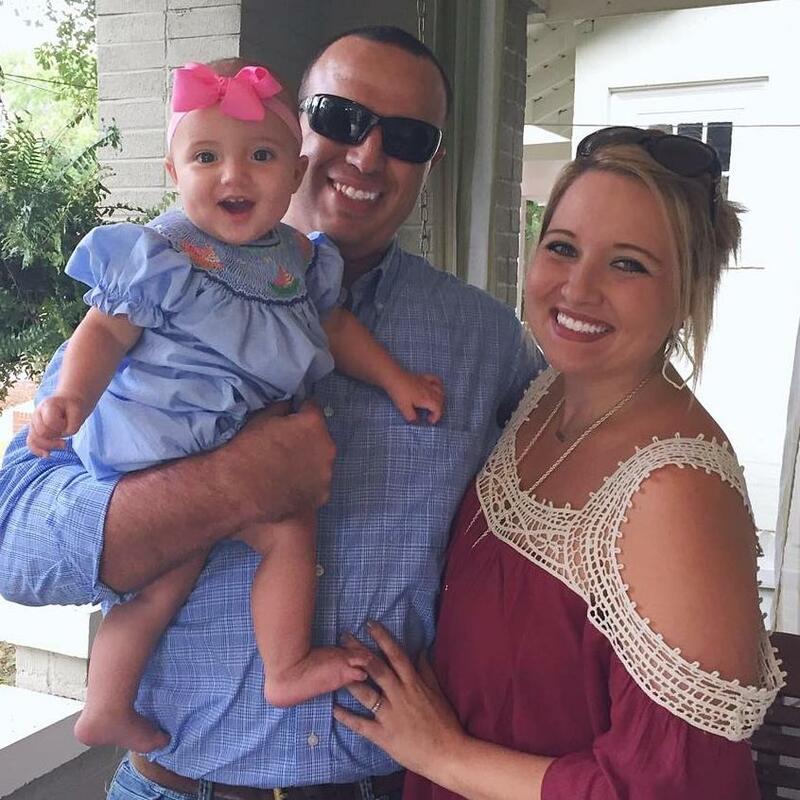 I'm sure sweet little Charlie Beth will have the most beautiful nursery! SO exciting! Charlie Beth is going to have one adorable room, I can't wait to see it finished!! LOVE LOVE LOVE! Can't wait to see what you do with it all! :) Ps.. any clue where that rug came from? I wanted one like it for Charlotte's nursery, but couldn't find it, so I settled with an all white one, which looks adorable, but I was really wanting a pop of light yellow!